Hi everyone! Lately if I've been doing nail art, it's been stamping weirdly enough. I'm not usually a HUGE fan of stamping but little time has meant I've been doing more and more. I was going to freehand this mani but then decided stamping would be quicker. I started out with 2 coats of China Glaze Agro from the 2012 Hunger Games collection. I really liked this collection and Agro is one of my favourites from it. The formula is great and I love the rich metallic green. I decided to pair it with gold and stamp a simple stripe from the MoYou Pro XL 01 plate using Essie Good as Gold. I like simple designs like this near the cuticle. I finished with a coat of topcoat as always. I really enjoyed wearing this mani. It was simple yet striking. What do you think of it? As usual you will find the maker's description in italics then my notes for each colour right after. For all swatches I used Paint Box Polish Like Lightning quick dry topcoat. Kindness is a warm toned dark grey polish with a heavy dose of gold shimmer. A beautiful polish that covers in 2 coats. 2 coats and topcoat. I love the combination of the warm golden shimmer with the grey. A nice alternative to cooler greys. Calm is an icy slate blue shade that applies like a dream and has a heavy dose of brighter blue shimmer. Opaque in 2-3 coats. 3 coats and topcoat. I really love the blue shimmer in this. I love a good blue polish and always enjoy wearing them and this one is unlike any other one in my collection. I can see myself coming back to it a lot. Harmony is a creamy mauve polish with a soft blue shimmer. It goes on like butter and is opaque in 2 coats. 2 coats and topcoat. The contrast of the blue shimmer against the mauve is really pretty. I love mauves, especially for clothes and eyeshadows. I'll definitely wear this one again soon. Peace is a soft white polish highlighted by green-gold-pink chrome flakies and holo flakies. Not a stark white at all, and opaque in 2 coats. 2 coats and topcoat. I'm a sucker for a white polish with flakes or glitter of any sort and I LOVE this one. The multicoloured flakes make it unique in my collection. Love is a bright, pale pink with gold and pink shimmer as well as a soft holographic effect. Covers in 2-3 coats. 3 coats and topcoat. I love the hint of holo in this. A really delicate polish. Concerning the formula and application, I didn't have any issues whatsoever. The formulas here are fab, despite the colours being pale. As mentioned, I used 2 coats for all polishes except Calm and Love where I added a 3rd to be sure of complete coverage for photos. But I probably could have gotten away with 2. This is definitely a calming and soft collection and I've been craving these types of colours recently. It's like Pam read my mind! The All You Need Is... Collection is releasing February 18th at noon EST. Each polish retails for $10 for 15 mL full size bottles and $6 for 8 mL luxe minis. For the first two weeks after release, full sets will be offered at a 15% discount. Hi everyone. Today I have a quick and simple nail art post for you. I haven't actually been doing that much nail art recently. I know...terrible right? A mix of not feeling like it and not having much time have meant that I've been wearing my polish plain most of the time. Though I recently got this lovely soft brown creme on sale from Paint Box Polish and wanted to add a little something to it. Originally, I was trying to get inspired for Valentine's nail art. But I don't celebrate Valentine's Day and wasn't really fancying wearing Valentine's nails when I did these. But I did use some pink and do some nail art anyway, even if it was just some quick stamping. I started out with 2 coats of Bacio. I then used Color Club Miss Bliss and MoYou Pro XL 01 plate to stamp the small polkadots. I finished with a coat of topcoat as always. I really like the combination of pink and brown even if the polkadots didn't stand out quite as much as I'd hoped. What do you think of this mani? Bacio is still on sale over at Paint Box Polish so if you like it go grab it before it's gone! Hi everyone! In today's post I'm sharing a couple of polishes which I was super excited to buy. These are the most exciting additions to my collection in a while. Ever since seeing the first promo pics from Girly Bits of the December 2016 CoTM duo, I knew I had to have them. I was especially excited about Grandma Got Run Over By A John Deere but I honestly LOVE both and actually wish they were core colours so I could get backups. I'm going to start with my favourite though...Grandma Got Run Over By A John Deere is 'an interesting shade of green that sits somewhere between dill pickle and pine with a strong copper shift, swimming with the tiniest holographic sparkles'. I don't think I can do much better than Pam's description other than to say that the shimmer and shift are out of this world. I'm a huge fan of Pam's complex finishes but this one is just outstanding. One of my favourite Girly Bits and one of my favourite polishes ever. Easily. I used 2 coats and topcoat. Xmas & O's is a rose gold foil polish. If you are a regular reader, you might know that I love this finish. Metallic flake foil polishes are kind of a recent obsession for me and this one is no different. I love rose gold and this feels 'neutral' yet elegant if that makes sense. I used 2 coats and topcoat. Unfortunately as this was a Color of The Month duo, these polishes are no longer available. You might be able to grab them in a destash or sale maybe. 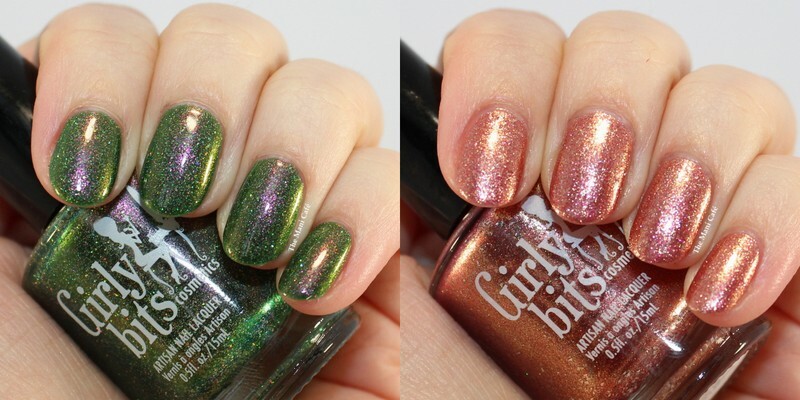 Girly Bits has so many other gorgeous polishes and a new LE duo each month!